The Quinnipiac rugby team was dominant in its 85-3 victory over Brown on Saturday afternoon in Hamden. Quinnipiac scored early and often in this one, with five tries in the first half and eight in the second half. 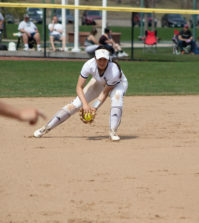 “Everyone expects our backs to be the ones that deliver – and they did today – but it was really just this effort that was made across the board if you look at how the scoring was broken down,” Quinnipiac head coach Becky Carlson said. “It wasn’t one or two people specifically. There happened to be a lot of people in the right spots and they were all supporting each other. 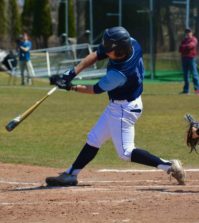 From the get-go, the Bobcats seemed to be in the right spots. Just three minutes into the game, freshman wing Clara Lemal-Brown scored the first try of the game to give the Bobcats a 5-0 lead. Lemal-Brown primarily gets the ball on the outside and has a lot of open field in front of her. Today, though, she had to utilize other parts of her game. “It’s not just her speed now, it’s her athleticism and using the stiff-arm,” Carlson said of Lemal-Brown’s performance. 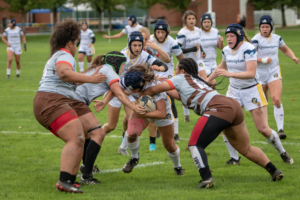 The Bobcats added four more tries in the first half, with two from junior captain Mikah Maples and one each from freshman fullback Allison Koenig and freshman flyhalf Mckenna Haz. Haz, who attempts the conversion kicks for two points after each try, was 10-for-13 on the afternoon. Quinnipiac took a 31-0 lead into the half and Brown hardly got past midfield with the ball. Believe it or not, Carlson still felt her team could’ve been better. As dominant as the first half was, Quinnipiac poured it on even more in the second. Again, it only took the Bobcats three minutes to get on the board as freshman flanker Matja Saarenheimo-Vanderhorst scored her first career try. Senior wing Caitria Sands and freshman wing Margot Vella both added tries within the next 10 minutes, and then it turned into a one-man show. Lemal-Brown, who scored the first try of the game, scored three straight tries in a seven-minute span to push the Bobcat lead to 71-0. While the freshman wing gave credit to her teammates, her coach was quick to give her the shine. Senior captain Emily Roskopf and sophomore flanker Remy Spires added two more tries to push the lead to 85-0 before Brown kicked a conversion as time expired to save itself from a shutout. Quinnipiac improves to 3-3 on the season and has now won three of its last four matches. Next week, the Bobcats travel to Penn State to take on the Nittany Lions on Saturday, Oct. 20 at 1 p.m. Lemal-Brown, for one, is eager to get back out there after Saturday’s big win.